(Reuters) - The U.S. Soccer Federation defended on Friday its treatment of the World Cup-winning national women's team and said it was surprised at a recent lawsuit (USWNT) alleging gender discrimination. 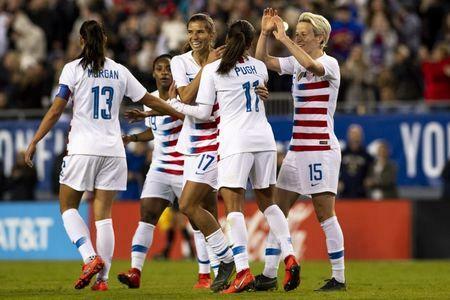 All 28 members of the U.S. women's squad were named as plaintiffs in the lawsuit that was filed in federal court in Los Angeles on International Women's Day last week. It includes complaints about wages and nearly every other aspect of the team's working conditions. Federation president Carlos Cordeiro said in an open letter that the body had made a sincere effort to provide the very best resources possible to the women's team. "U.S. Soccer believes that all female athletes deserve fair and equitable pay, and we strive to meet this core value at all times," he added. The lawsuit comes just three months before the U.S. women open their World Cup title defense in France. The players said they have been consistently paid less money than their male counterparts even though their performance has been superior to the men's team. According to the lawsuit, filed three years after several players made a similar complaint with the U.S. Equal Employment Opportunity Commission, U.S. soccer has "utterly failed to promote gender equality." Cordeiro, however, said the soccer federation continues to be a champion for the women's game in the United States and on the global stage. "From our proactive efforts to grow and invest in women's soccer at every level in the U.S., to advocating for the improvement and increased support of the women's game worldwide, U.S. Soccer is active, committed and passionate in its support today and will be into the long-term future." Cordeiro added that the federation had in recent years increased its investment in the USWNT program and worked in close partnership with the players to ensure they have everything they need. "We have added additional technical and high-performance staff focused only on the USWNT, provided additional charter flights to improve travel, and created two elite women's international tournaments to provide high-level competition in the United States, among other efforts to support the team," he said. "We also continue to expand our investment in female player development programs, including our eight Youth National Team programs and the Girl's Development Academy." Cordeiro also pointed to a 2017 agreement with the women's team. "In April of 2017, we agreed to a fair and equitable collective bargaining agreement with the Women's National Team, which included a contract structure that the players specifically requested to provide them with a guaranteed salary and benefits. "At no point since that time have players raised concerns about the CBA itself, and we continue to work with them in good faith." Cordeiro said he had spoken on Wednesday with some of the veteran players to better understand their thoughts and concerns. "Our initial conversation was open, cordial and professional, and we will continue to work to resolve this matter," he said.